Who better than a Recreation Ranger to give tips on visiting a beautiful Forest Park? This month we spoke to Lucy Hadley, from Forestry Commission Scotland, for ideas on things to see and do in the Galloway Forest Park and what makes the skies above it so special. If a visitor only has one day to explore the Galloway Forest Park area, what would you recommend they do? Kirroughtree Visitor Centre makes a great destination to base yourself for the day. As well as a visitor centre serving refreshments and meals, there are world class mountain bike trails suitable for all levels of ability, great forest trails with picturesque lochs, red squirrels and roe deer if you’re lucky to catch a glimpse, bike hire and sales, and a play-park that is very popular with our younger visitors. We are also having a brand new visitor centre built which will be ready at the end of the year. What wildlife can you see? 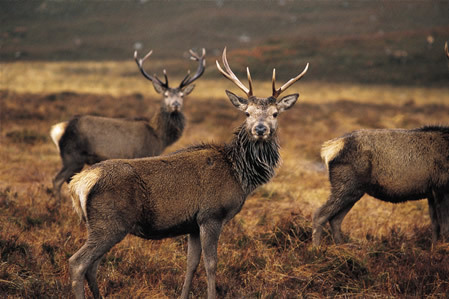 We have four of Scotland’s BIG 5 in the Galloway Forest Park – red deer, otter, red squirrel and Golden Eagle. The fifth (harbour seal) can be seen in the region along Dumfries and Galloway’s coastline. To add to that you may also see or hear: red kite, osprey, wild goat, peregrine, black grouse, nightjar, pine marten, as well as great shows of bluebells and snowdrops to mention a few of our highlights. Any time is a great time! From the autumn rut at our Red Deer Range to spectacular dark skies in the winter. Baby wild goats in a stunning springtime landscape, red kites, ospreys and amazing summer insects. Whenever you visit there’s always an adventure to be had. What are your highlights of the Forest Park? I absolutely love the Red Deer Range – it’s one place in the Galloway Forest Park where you can get fantastic views of red deer, without a hike into the hills! In May/June the females have their young which are really cute! There are regular tours throughout the summer which are brilliant for close up views. The Red Deer Range is great for families and we run regular tours during the summer. We also run a programme of events during the year, many of which are suitable for families including our Christmas event at Kirroughtree where families get to meet Santa and buy their very own real Christmas tree! What is special about the skies above Galloway? They are very dark. The Sky Quality Meter scale is from 0 to 25. You would get a reading of 8 in the middle of a major city such as Glasgow or Edinburgh, whereas a 24 would be measured in a photographer’s dark room. Based on this scale, the Forest Park’s scores range from 21 to 23.6 which gives us as near to total darkness as you can get given the populations around us. What can people expect to see if they are stargazing on a summer’s evening? The best time to get the full impact of the UK’s first Dark Sky Park is from October to March. On a clear night during winter you can see the milky way, as well as planets and constellations. Where do you think is the best place to view the stars? We have identified ten locations within the Galloway Forest Dark Sky Park that are great for viewing the night sky. They have good vehicle access and mostly not too far from a main road. What are the first three words that come to mind when you think about the Dark Sky Park? Do you have any other tips for visiting Dumfries and Galloway? Dumfries and Galloway is a fantastic place to visit at anytime of the year, the landscape is beautiful and there’s some amazing wildlife that lives here too. There are heaps of wildlife events that take place at various sites across the region throughout the year, these can be viewed on Wild Seasons to help you plan your trip. Are there any special events or things not to miss in autumn or winter? The autumn red deer rut is a definite highlight. You can visit the Deer Range in the Galloway Forest Park to watch the drama unfold and hear their magnificent bellowing. Don’t miss the Leonids and Geminids meteor showers which take place October/November and December respectively. On a clear night you could see up to 100 meteors an hour. I got great views of the geminids a couple of years ago which was amazing! Wrap up warm though because you can get cold very quickly standing about outside. A flask of hot water and some hot chocolate makes for a yummy treat!